In today’s world, it is nearly impossible to find a dream home at a reasonable price. Ultimately we all have to compromise a little bit. However, for some of us this means having a kitchen space that is not big enough. But hey, don’t worry! Small kitchen spaces do not mean it’s the end of the world. In fact, they provide you with an opportunity to get creative and aesthetic. You can come up with some really cool, clever and quirky solutions that will help you transform your small kitchen in Northampton into a cosy and welcoming space. Using a dark colour scheme will make your small kitchen room appear smaller and more cramped, especially when the room does not have much exposure to natural light. This is why it is necessary to incorporate bright and vibrant colours in your small kitchen room. Be it the kitchen door, work surfaces or small appliances, incorporating bright colours will open up the room and instantly make it feel cosy and welcoming. More importantly, you don’t always have to opt for plain white. You can opt for peachy pinks, lemon yellows and green mint colours. One of the major things that an average kitchen is full of is – the ‘dead’ space. These kitchen rooms will have so many unused nooks that could be easily transformed into a useful storage space. So if your kitchen room has such areas, think about transforming them into a beneficial space. You can use sticky pads to attach the trash bin to the inside of the cabinet door so it does not take up space on the floor. Or you can hang a small basket on the back of the kitchen door, which could then be used to hold small kitchen essentials. Although you have limited floor space and work surface space in your small kitchen, think about the wall and ceiling space that you have available. So, how about making the most out of it? Shelves are the best storage solutions in a small kitchen space. But make sure you build them upwards and not outwards. Store away your kitchen items as high as you can. There has been a trend lately of hanging pots of fresh herbs from the ceiling with their leaves cascading downwards. If you incorporate this trend in your small kitchen, not only will it save space but it will also become a great talking point for your guests. Let’s get creative with the fridge magnets! And by this we certainly do not mean using them to hold your child’s school term calendar. You can use strong fridge magnets to hold small storage pots onto your fridge or freezer door. Most importantly, they become a great storage space for storing lightweight items and objects. Use these pots to store herbs and spices. This way, all your spices will be at a reachable distance from you while cooking. Isn’t that great? Following up on the concept of building upwards and not outwards, did you know that there are several kitchen appliances available in the market that are made to be stacked on each other to save space? Well yes, you heard it right! If you have separate fridges and freezers then stack them up to make ‘fridge freezer’. Moreover, you can stack washing machines and tumble dryers on each other too. If you are worried about the safety of your appliances, you can purchase inexpensive stacking frames to keep your appliances secure (works well even when the appliances are in use). This is a great way to maximise your floor space and reduce the cramping feeling. By using these kitchen hacks, you will love your kitchen space no matter how small it is. Make use of bright and vibrant colour schemes and customise the layout to build upwards and not outwards. Use every single corner of your kitchen space to maximise storage and to keep your kitchen well organised and looking incredible at all times. 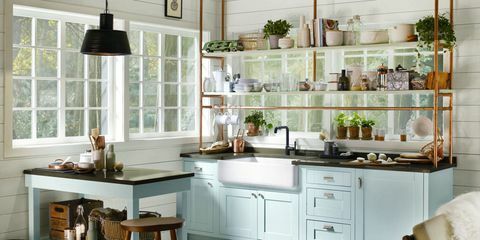 It doesn't matter if you have a small kitchen, because with these hacks you can transform it into a functional space that works as good as any!